Justified is currently moving into production on it's sixth and final season, which is a decision I applauded. As much as I love the series, I which more creators would take the kind of ownership over the value of their work like Graham Yost has, and decide that their work will have an end point, rather than just letting it go. Knowing when something will end allows a greater creative freedom than letting the future be a mystery. At the very least, it means you don't spend half you time tripping over your own feet, setting things up and never knowing when you can knock things down. "Sam Elliott will portray "Markham," a legendary Kentucky gangster who returns from exile with a private army and bags of cash (earned growing legal weed in Colorado), hell-bent on winning back his empire and the lost love of his life, Katherine Hale (Mary Steenburgen). He’ll find himself butting heads with Raylan and Boyd and even with Katherine herself, who secretly believes that Markham is the rat who brought down her husband. Garret Dillahunt will play "Walker", a spec ops veteran who’s spent much of the last decade deployed in combat zones, first as a soldier and most recently as a private contractor. He now handles security for a quasi-legal businessman, a job to which he brings all of the skills (as well as the demons) he acquired during his military career. Walker hides his simmering rage behind an exterior of cold professionalism — until the combined irritants of Raylan and Boyd wear away his veneer and bring the monster to the surface." Dillahunt played two separate roles on Deadwood, a show that Yost and star Timothy Olyphant have often turned to when casting guests on Justified. 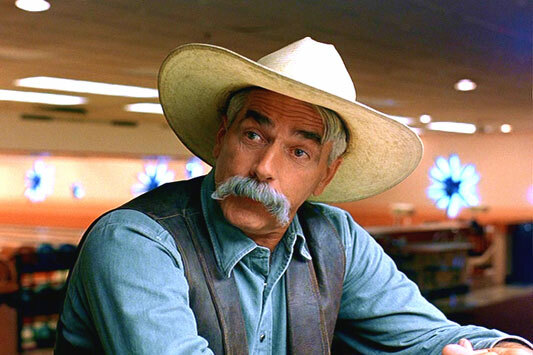 And Sam Elliott is as cowboy as you can get. Both will fit in perfectly to the Leonardian universe Yost has masterfully created. I looking for big things from this last year of Justified, and this a hell of a good start.